The population in Uganda is about 41.5 million people. Of these, more than 50% use cellular services. This opens up excellent business opportunities terminate calls. By installing Dinstar Elastix or other VoIP equipment in Uganda, you will be able to make about $250 via one gateway channel. In order for the business to bring a stable profit, it is important to choose the optimal prepaid package. The largest GSM operator in Uganda is MTN UGANDA. Its services are used by more than 11.5 million subscribers. An MTN SIM-card costs $0.56, with 14 bonus immediately granted cents to the balance. MTN Classic. The standard rate for calls is $0.05 per minute both inside the network and the numbers of other operators. MTN Call per Second. The second of the call will cost $0.0011, it's convenient for short calls. The cost of a minute via this package will be $0.06. MTN Zone. Includes 4 tariff plans. MTN Zone Bundles requires that you pay $ 0.14 per day, as well as it provides an 85% discount on calls during the day. Night Zone provides cheap night calls, which is $0.0018 per second. Using Holla Zone, the subscriber receives 50 free SMS and 20 megabytes of Internet every night. Weekend Zone provides 95%discounts on calls on Saturdays and Sundays. MTN Paka Paka. This package includes many bonus offers. 2 optimal options are 100 free minutes per day for $0.83 and 350 minutes for $2.73. 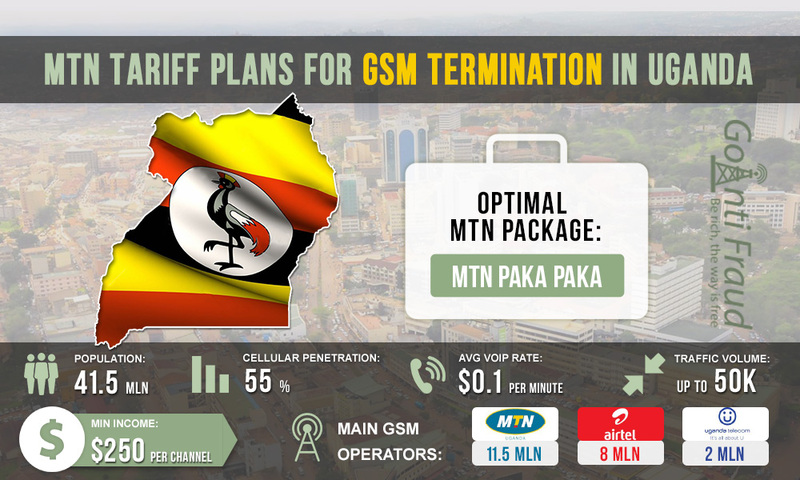 The termination provider is better off using MTN Paka Paka. Connecting bonuses depends on the amount of traffic that you are going to terminate. If you use 100 bonus minutes, one minute of the call will cost $0.008, if you use 350 minutes, it will be $0.007. In the first case, your income will be at least $150 via one channel. Terminating 350 minutes a day via MTN Paka Paka, you will make about $600 per channel of equipment.